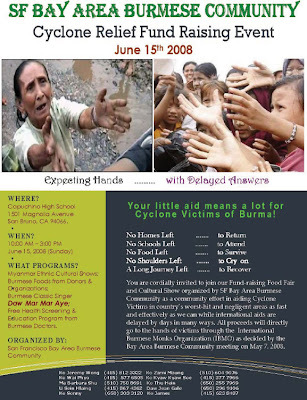 We want to cordially invite you to our Cyclone Relief Fund Raising Event as a first ever SF Bay Area Burmese Community effort for Cyclone Nargis Victims of Burma. Speakers and Cyclone Aftermaths Presentations. Burma’s most renowned Classic Singer Daw Mar Mar Aye will help perform in our event with Metta. Students of Theravada Dhamma Society (TDS) will offer Swan (Alms food) to Buddhist Monks from Bay Area Monasteries. Karen Fellowship will help perform the Karen Bamboo Dance if chance is given. United States Burmese Medical Association (USBMA) will offer a free Health Screening and Education program for the community. There will be a First Aid team during the event too.